Classic with a touch of contemporary, this Personalized Paisley Faith Pillow Case looks great even in the a formal location. Lovingly adorned with the words faith and blessing, this personalized gift is the perfect way to honor their spiritual side. Made of luxurious poly sateen, the pillow case measures 22" x 30" and fits a standard or queen sized pillow. 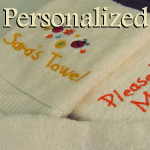 Personalize with one line of up to 20 characters. NOTE: "Faith" and "Blessings" are standard to the design.